Bespoke boutique white storage cabinet, with LED and Diamante trim. This retail style storage cabinet can be used as a perfect way to allow beauty retailers and boutique owners, to be able to showcase their most precious possessions. 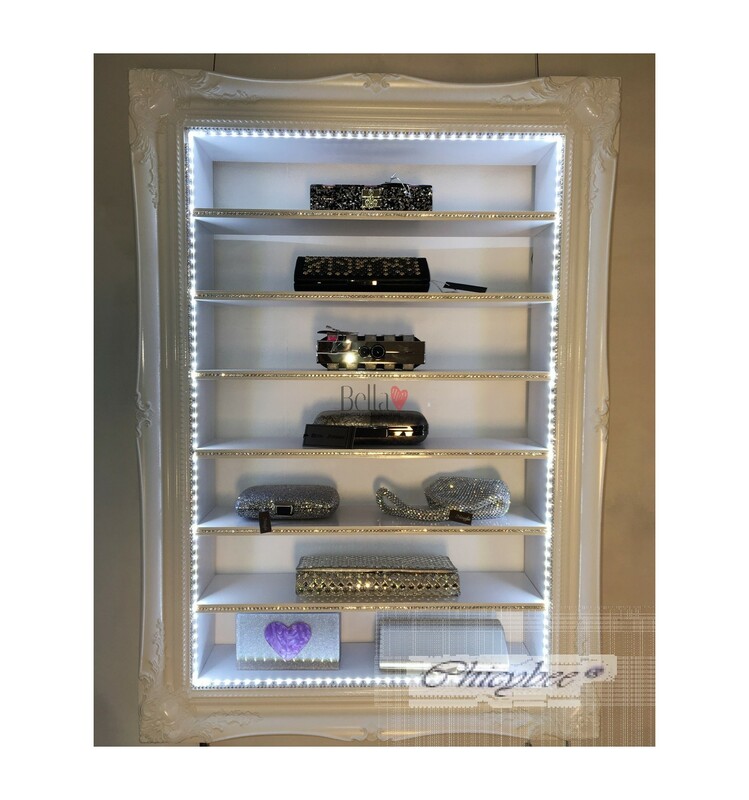 The Bella retail style boutique cabinet with LED lighting and diamante trim can add an extra touch of sophistication to your beauty area or store. 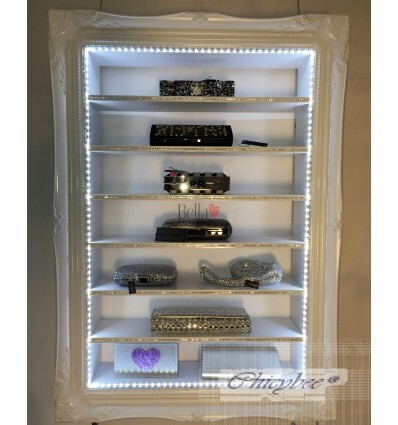 This extra large style of display cabinet comes with LED lighting, diamante trim and features sparkly wallpaper as a background to the shelves. What an elegant addition this would make to your Boutique or shop and a great space-saving way to display your products. This frame has been painted with a high gloss white and each shelf is highlighted with LED lighting to highlight your beautiful products. Along each shelf and set into the wood there is super sparkly silver plated Diamante crystal trim which adds extra glamour and the whole piece just sparkles. The luxury white sparkle wallpaper at the back of the frame finishes off this stunning & unique display frame. All our cabinets arrive, to you ready to hang on the wall with the correct fixings for the size; you just need to supply the screws. We don't supply them as we do not know what your wall is made of i.e. : brick or plaster so you will need somebody to make sure the right screws and raw plugs are fixed properly to hold the weight. The weight for a cabinet this size is quite heavy and once you have filled it with items obviously the weight will increase and you need to ensure it is hung safely. Please bear in mind these are all handmade display cabinets and as such are made to order. The lead time is normally up to 3 weeks but if we have one already in stock then it will be dispatched sooner. If you have a new shop opening or a launch date to meet then we can often accommodate this so please do ask. Our shipping costs reflect the time and care taken to pack your order to ensure it reaches you safely and undamaged, we use a specialised shipping company to ensure the order is sent `door to door undamaged. This is a tried and tested procedure and the only delivery method we would use on such a large precious product. We do offer discounts on multiple orders and deliveries. Delivery is always trackable and we are also able to offer weekend delivery for an extra cost.